As well as it being over a year since moving to Bahrain, it’s also been over a year since I began working remotely from home. I just have to take that in myself a little bit. It’s been over a year since I’ve had to have any sort of daily commute or work in an office environment. Unless you count the commute from the kitchen to my study. All 5 steps. The other day I said to A, I’m not sure whether I could go back to working in an office environment. 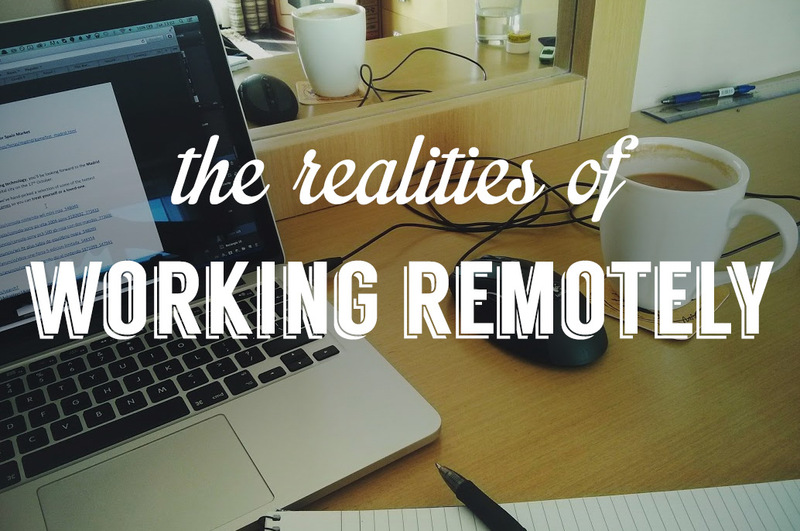 Working remotely, from home or wherever you choose, definitely isn’t for everyone. I slipped into the working from home routine pretty easily. I did learn a few things on the way. Going to the gym has become a pretty important part of my routine since I began working from home. While not every remote worker has fixed hours, I do. I need work to my company’s London office hours. Which are 10:30am – 7pm for me. So I needed to make sure I had a fixed routine so I could separate my work from my personal hours. What with working from home, it’s easy to let that line get blurred. What worked for me was getting up a few hours before work, either get in some gym time before work or have a nice quiet breakfast with a book. 10:30am, it’s work time, until lunch. I make sure I take my full hour lunch break. Mostly because the lunch break is the only time during the week when A and I can have any time together. After lunch, I work until 7pm, then I’m done. The fixed hours really help me separate my working life and personal life while still existing in the same space. It’s not glamorous, but this is where I work. One day I’ll have a few little succulents to keep me company. I work from home. So I live where I work and vice versa. I knew I needed a separate work space, of sorts. Somewhere that was a designated work area. Not in front of the TV on the sofa. Not on the dining room table. Somewhere else that could be my work space. While I don’t have a desk or anything, there’s a spare bedroom which happens to have a dresser at the perfect desk height for me. I’ve now adopted that room as my study. My laptop, notebooks, stationery and everything work related lives in that room and nowhere else. Once I’m done with work, I can step out of that room and feel like it’s over and done with. The same thing in morning – once I’m at my desk, it feels like I’m at work. A very handy notebook the lovely people over at Trendline Interactive sent me. It’s a freebie, but an incredibly useful freebie! Working in an office, you’ve got the luxury of the company providing you with pens, paper, post-it notes, everything! Even a laptop. I gave all that up when I moved to Bahrain to work from home. I thought I was the kind of person who would be able to live without a notepad and pens – isn’t that what computers, tablets and phones are for? Nope. I needed something to scribble quick things down and draw sketches. So bit by bit I got everything I needed for my little office. Still working on it though – ideally I’d love to have a standing desk and external keyboard. Eventually! Working remotely you need some sort of app to be able to communicate with your team members, wherever in the world they are. But also, a lot of apps play an important role in helping me keep organised and manage my own workload. After all, I’m here on my own and there’s no one but me to make sure I’m doing everything I should be doing. For communicating with the team back in London we’ve got Skype and Google Hangouts, if Skype goes on the fritz. To help me manage my own workload I’ve gone through a few different apps, from your bog standard note taking to to-do list apps. You’ve got your Todoist, Any.Do, Wunderlist, Google Keep – the list is pretty damn endless. I’ve settled on Evernote. An app I’ve gone to and from time and time again. I’ve created a notebook for anything work related, with various different notes with either lists of what I have to do or general notes on what I’ve done for the day. It’s definitely helped me keep track. And yes, you can do this with traditional pen and paper! It’s finding what works for you to help manage your days. Because there’s no one but you to manage your time for you when you work remotely. Get all the help you can. I could easily go from the start of work to lunch, have my break and then work until 7pm without getting up. But that is REALLY bad for you. I try to get up out of my seat at least every hour. Stretch my legs, get some water and then hit the desk again. Working in a creative role these breaks can help me get out of creative ruts I may be stuck in or help me figure out solutions to problems I’ve been dwelling on. The brain needs breaks. I spent a lot of my time peering through the doors rather than just stepping through them. This is one thing I’m guilty of not doing. I have my reasons/excuses. I guess it’s more valid if you work from home rather than from coffee shops or rented desks. It is known for me to go an entire week without leaving the flat and having a major case of cabin fever by the time the weekend hits. And while I want to get out of the house, A wants nothing more than to veg at home. My get out of the house thing is going to the gym. It’s a bit of a cheat, because the gym is in the building. But it gets me out of the flat at least. Give your brain the change of scenery every so often. Remote working is becoming more commonplace. With small and large companies alike realising that they’re not going to always get the best talent in their locals and some may not want to relocate. Or heck, someone might do what I did and want to completely relocate but keep the job. It’s an inviting scenario. Getting to work from home, or wherever you want. Not having to deal with a commute. But there’s a lot to consider before you make that jump. Hope my own personal experience of working remotely from home has shed some light on it, if you’re thinking about making that jump. Any other remote workers out there? Have been there too Emily – casually browsing reddit or my feedly when I should be concentrating – it’s so much harder to stop yourself when you’re the only person in the room! Wish I could work from home, but never had an assignment where it really could. Don’t know if I would be able to do it when the kids are around. For most of the day I’m on my own. So that helps. Can imagine kids would be a huge distraction! Working from home has always been my dream. I wish there are many opportunities to work from home in Malaysia. I think your workplace looks nice. So this is where the magic happens! I always wondered what your office was like in Bahrain. I can get into the same mentality of not leaving the house for days on end, but since I’ve started going to the gym more regularly, I at least see someone other than Mr. T now! Very much a mixed blessing. There are some days when I wish I could just sit somewhere else and really have time to concentrate. But then I put some music on and just get my head down. If I worked from home, I’d also need a routine like you to structure my day. No, I don’t think you could go back to commuting :). I’ve done work-from-home in the past. As an introvert myself, it is definitely appealing(avoiding the commuting and not having to constantly be distracted by co-workers). That said, I agree getting out of the house is a good idea, fresh air and sunlight gives you energy. Hi, my name is Audrey, 33YO from the Philippines. I’ve been working from home for three years now. It does have its perks, working at a time that I like. I didn’t anticipate was working from home when all your friends from school has moved out to different cities, married and having kids. So, no social life for me really. Also, I keep checking the refrigerator whenever I feel like it. I’ve actually gained TONS of pounds because of it. That’s another disadvantage. I guess it’s still depends on the person if they are the active, outdoorsy type. I’m thinking of going back to the corporate world, maybe in an industry that is still up and coming in my country like Digital Marketing. I loved that I had these years to recuperate and reenergize. Yeah, you do have to be pretty strict with your snacking when working from home. It’s so easy, and tempting, to go for that mid morning, after lunch, pre dinner snack, because it’s all there. It’s something I nearly fell into doing, but managed to stop myself and just make sure I drank plenty of water vs. snacking. Also the gym – making sure I have that in my routine counteracted the very sedentary life of a home workers.